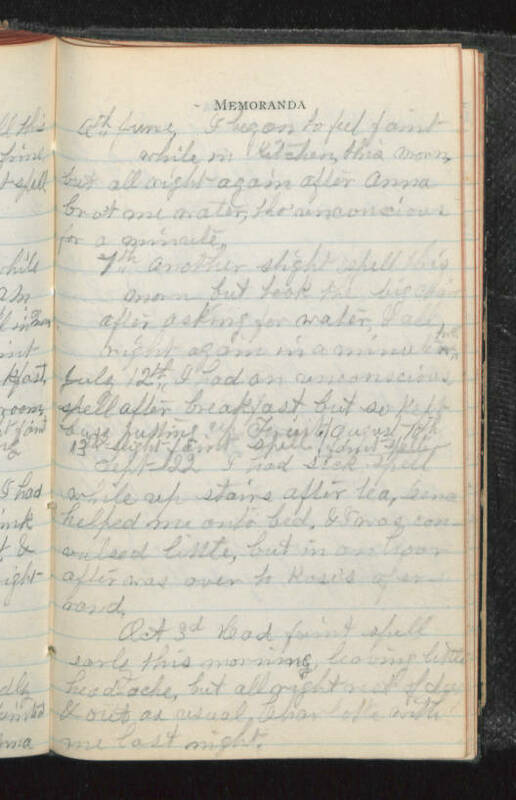 MEMORANDA 6th June - I began to feel faint while in kitchen this morn, but all right again after Anna bro't me water, tho' unconscious for a minute. 7th June - Another slight spell this morn but took the big chair after asking for water, & all right again in a minute. July 12th - I had an unconscious spell after breakfast, but so kept busy putting up (illegible) 13th - slight faint spell (illegible) Sept 22 - I had sick spell while up stairs after tea, Lena helped me onto bed, & I was convulsed little, but in an hour after was over to Rose's afterward. Oct 3d - Had faint spell early this morning, leaving little headache, but all right rest of day & out as usual, Charlotte with me last night.